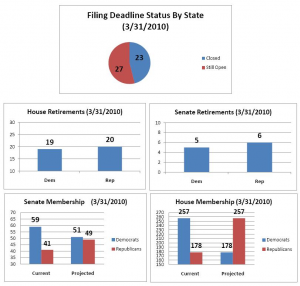 Over the past two weeks, Congressional candidate filing closed in South Carolina, South Dakota, and Missouri. Candidate filing closes today in Tennessee and tomorrow in Alabama. As with our last update, there were no last minute retirement announcements coming from those states; three Republicans had some time ago announced plans to retire or run for another office in those states. All incumbents except a freshman Republican in Missouri received a partisan challenger. This means that right now, we know who the Congressional candidates are in 223 of 435 House races and in 16 of 36 Senate races. 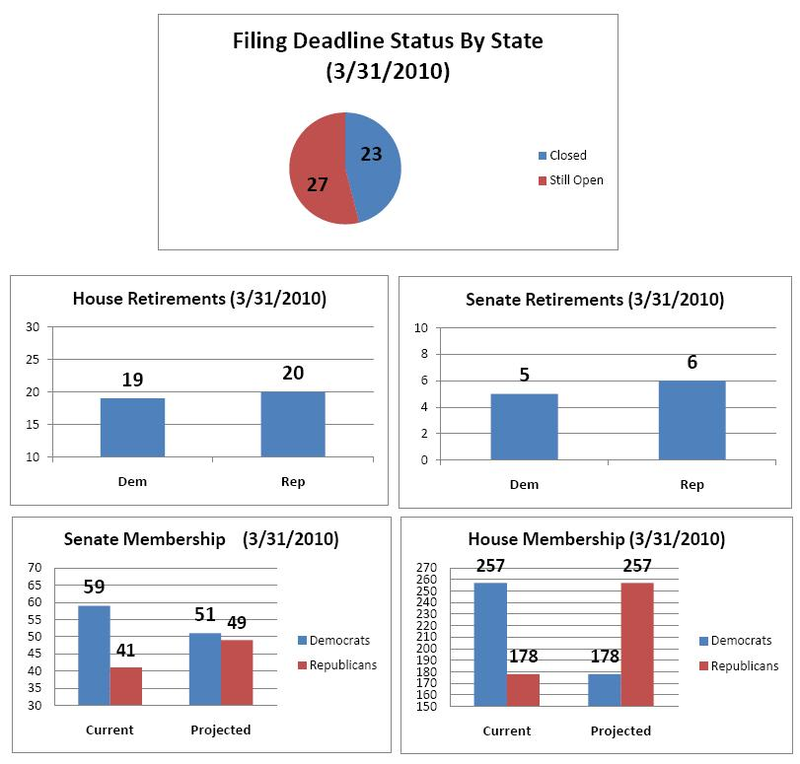 In the next few weeks, we will see Congressional filing close in Tennessee (today), Alabama (tomorrow), Virginia/North Dakota (April 9), New Jersey (April 12), and Florida/Georgia (April 30). In other words, by the end of this month, we will know who the Congressional candidates are in over 2/3 of the House seats, and in 30 of 50 states. Correction: In our last election update, we had mentioned that in California, 11 Democrats and 5 Republicans received no partisan competition. We have since received more complete information from the California Secretary of State that shows many of that “Gang of 16” did, in fact, receive partisan competition. This means that only one Democrat and two Republicans will escape partisan competition, bringing the revised grand total down to 17 House members (3 Democrats and 14 Republicans) who don’t have to worry about their seat changing partisan hands. There were no announced Congressional retirements in the past two weeks. Interestingly, 28 year veteran South Carolina Democrat John Spratt put to rest rumors that he would retire; shortly thereafter, he disclosed that he was diagnosed with Parkinson’s Disease. So far, only Illinois and Texas have held primaries. Beyond that, there will be no other major statewide elections until May 4, when Indiana, North Carolina, and Ohio hold partisan primaries. There has been a significant development on the special elections front, however. The special election that was to have occurred for Eric Massa’s vacated House seat in New York will not be held, which means this seat will be vacant until the fall elections. In the meantime, upcoming elections in Florida (April 13), Pennsylvania (May 18), and Hawaii (May 22) will be good tests of the level of Democratic voter strength before the fall balloting. Previous Article OK, That’s It. Steele Has To Go.